We highly recommend Socialite Events for any celebration! Derek and I used Socialite Events for our wedding last November. What we liked most, was the fact that it really was all about us! April was with us at every meeting with the various vendors and helped us to stay within our budget, by coordinating and negotiating with such professionalism all the while keeping mind the final outcome of our wedding. In addition, she helped to ensure that we stayed on schedule throughout the planning, even though we were a quite laid back couple. Our wedding was everything that we hoped for and more! 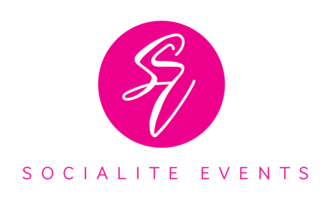 Socialite Events has the BEST Service in the Event Planning industry! April Pyatt is extremely professional and timely. As a constantly evolving business, we have to have Events that reflect our core mission. Socialite Events always meets our goals! We highly recommend April Pyatt from Socialite Events to be your wedding coordinator. She was well organized, and she did a wonderful job coordinating everyone on the wedding day. She was by my side every step of the way, and made sure I was on schedule. Our wedding started at around 9:00am and didn't end until almost midnight...and April was there from the beginning to the end. We couldn't imagine a more perfect wedding...Thank you April and Best Wishes! April, what can we say but thank you, thank you, thank you. Thank you for listening, offering your advice, taking charge, and of course being patient with all our changes. I can definitely say having Socialite Events was well worth the money. I just want to thank you so much for all you did to make my day beautiful. I know it was like pulling teeth sometimes, but I truly admire all the patience and dedication you had in making sure my dreams come true. I'm getting teary eyed right now thinking about how the constant talks, visits, and planning we did together have come to a close. Thank you for all you have done for us, it has truly been a blessing to have you as a planner. Much love, blessings and success as you continue to make other brides dreams come true and expand your business. May God continue to bless you and keep you in all your future endeavors! I gave a 60th birthday party for my husband and my guests and friends are still raving about the great time they had. With April's help we had a great place, food, and music all in my budget. My experience with Socialite Events from beginning to end of our daughter's 2014 wedding was wonderful. She listens to what you envision and brought it to life! Attention to detail and strong network of contact in the industry! She takes the stress out of making your special day one to be remembered for years! I highly recommend April if you want an extra special, worry-free celebration. Socialite Events planned my first baby shower flawlessly. They were professional, creative, punctual and a joy to work with. I look forward to future planning events and would highly recommend them. April was absolutely amazing! She was organized and very helpful! If you want the best of everything, with flawless execution and a wedding planner that makes your special day as important as their special day, April and her team at Socialite Events are the way to go. The attention to detail, excellent service and OUTSTANDING vision is like no other! If we had to, we would do it all over again!!! I had the pleasure of working with April of Socialite Events as a musician and Music Director for a large wedding and reception in Columbia, MD. There were many unique components and requests of the bridal party and their families, and April handled them all with the utmost professionalism and courteousness. As Music Director, I had many questions and needs leading up to the wedding, and on the day of. Socialte Events made sure I had everything I needed. April was always accessible, responsive, and knowledgeable. If you are looking for an event coordinator or wedding planner, book Socialite Events to ensure that your event is a success!